Student notes on a Whitehead course on philosophy and metaphysics. Student notes on philosophy, metaphysics, mathematics. Notes taken during Whitehead's first year of Radcliffe lectures. 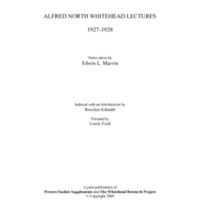 An edited version of these notes appears in The Harvard Lectures of Alfred North Whitehead, 1924-1925, edited by Paul Bogaard and Jason Bell.